This June UPA members will cross the US border to Rio Bravo, Mexico, to work with a mission of the Mexico Methodist Church! “Hands Together Mexico” is a ministry of the Methodist Church of Mexico that serves the Rio Bravo and surrounding communities with construction projects (Schools, community spaces, family’s homes, parsonages, churches), medical campaigns (Famlily medicine, surgeries, dentistry); orphanages, educational projects, community development centers, mission bible schools, disaster response, and humanitarian aid. We hope to raise $2,500 for construction supplies. BAPTISM: Frances, the daughter of Katie and Andrew W.
At the center a rose window which survived the fire of Notre Dame is the baby Jesus on the lap of his mother, Mary. Light radiates out first toward the twelve apostles who shared the story of Mary and Jesus and then the light extends through martyrs of faith into windows that illustrate human vices which are eventually transformed by the ripple effect of Jesus’ life, death, and resurrection. Every church and every Christian becomes a panel in that ever-expanding burst of light. If Christmas proclaims the central truth of Christianity that God’s love was incarnate in Jesus then Easter may be understood as a diverse set of perspectives which magnify that story. Each apostle offers unique facets of meaning. This Easter at UPA we focus on narratives from Luke and John, bright stories which ripple out to the story of a modern martyr, a school principal who risked his life for a stranger. Listen and hear how a simple act of love radiates far beyond time and place! This Sunday The Nebula Brass Quintet will be joining us. The Nebula Brass Quintet (NBQ) is deeply rooted within prestigious education and experience. The group first met 5 years ago in Boston Massachusetts. Andy Koskela earned a Bachelors from Berklee College of Music in 2013, studying with Charlie Lewis of the Empire Brass. He served 13 years in the Army Band, and is sought out as a professional trumpet player throughout New England. Samuel Costa earned Masters in Music Education from Kent State University in 2018. He is principal trumpet for the 215th “Governor’s Own” Army Band, and band director for Dighton Rehoboth Regional School District with over 10 years of experience in music education. Earl Powers holds a Masters degree from Cincinnati Conservatory of Music. He was principal horn for the Navy Premier Band in Washington D.C., serving for 10 honorable years. He is currently the principal horn for the 215th Army Band of Massachusetts. Caroline Cole holds a Masters in Music from Boston Conservatory. She is principal trombone for the 215th Army Band of Massachusetts. Additionally, she is an accomplished trapeze, tight wire, and circus artist. Rob Needs has been principal tuba for the 215th Army Band for over 30 years, and serves as the Nebula Brass Quintet arranger. He also plays french horn, trumpet, and electric bass guitar. 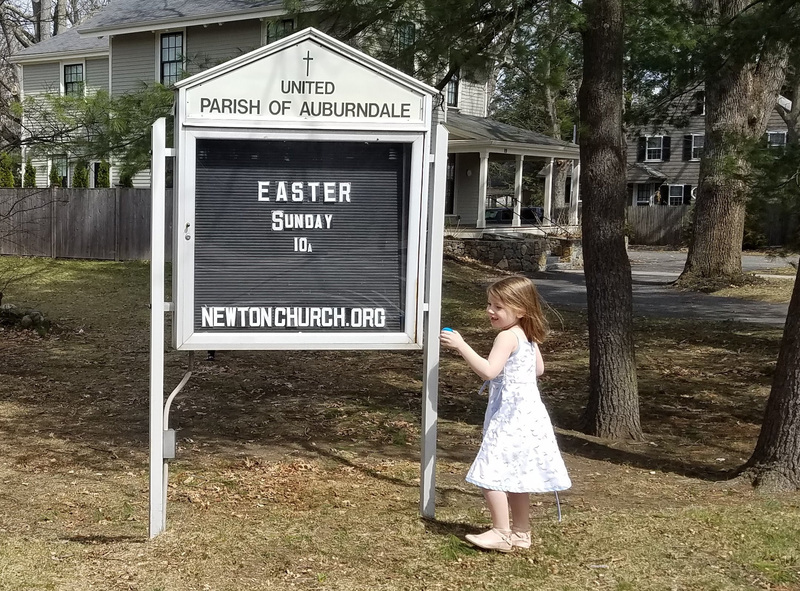 Sophia found an Easter egg in the church sign last year! JESUS IS ALIVE! Please join us in celebrating this wonderful day. If any youth are available 15 minutes before worship or right after worship to assist with hiding the eggs, please see Beth Viveiros this Sunday. All students are invited to stay in worship to enjoy the celebration of the day. After worship, families are encouraged to gather in the fellowship hall for snacks. At 11:30 all elementary students are invited to attend an Easter Egg Hunt.